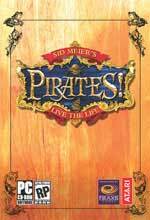 I remember playing the original Sid Meier’s Pirates! back when it was the only pirate game around. I’d sit for hours basking in the cold glow of my Amiga, pillaging villages and courting governor’s daughters. Years later I had the pleasure of revisiting the game on my Sega Genisis with the release of Pirates! Gold. And now Sid Meier has treated us to yet another installment of his wonderful creation. Popcap has a ton of cute little games, and they seem just intellectual enough that they probably increase your SAT scores or someting like that. Seven Seas is their pirate-based game where you sail around in your little ship blowing up other pirates. The tricky bit is that everyone moves on a grid, and if you’re good you can anticipate where the enemy pirates will go before they go there. If you’re not good – well – you get blowed up. It’s a fun game, and just a little addictive. The cannon blasts make a terribly satisfying “boom,” and the music’s catchy too. There’s an online version, but it’s not nearly so impressive as the one you can download. There’s a version for your Palm Pilot as well, if you’re so inclined. Rum helps us drink like pirates, costumes help us dress like pirates, and music helps us sing and dance like pirates. But there’s just not much out there that helps us ACT like pirates. Enter Ace Pirate Murder Mystery – you and seven-to-nine of your dearest friends get together to act like scalliwags, eat-drink-and-be-merry, and ruthlessly accuse each other of the most diabolical murder of Captain Kidd. Who could ask for more? 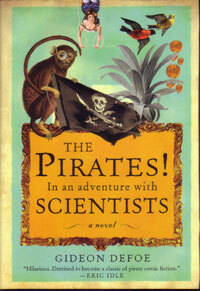 and 3) They most always feature a monocled-monkey on the cover, frequently clutching a pirate flag. The devil is in the details – and nothing completes the details of a fine pirate ensemble like a piece or two of choice pirate jewelry. Celtic Jackalope’s Pirate Medallion is a lovely sterling coin a slight bit larger than a quarter. 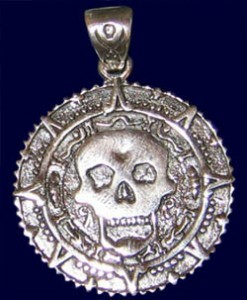 A la Pirates of the Caribbean, an empty-eyed skull stares outward from an Aztec-compass pattern, warning friend and foe alike that you’re not to be trifled with. Identical and fully-detailed on both sides, the surface is a wonderful mix between polished and roughed (shinier than the picture implies), which makes the imagery all the more striking. The coin itself is thick enough to remain solid, yet thin and lightweight enough that you could easily make it a part of your daily-wear without feeling like you have a coaster hanging from your neck. The bale, imprinted on one side with a skull & crossed swords image, is sturdy and appears to be welded. I’ve owned jewelry in the past where the bale would bend open, resulting in the whole affair falling off its chain. There’s no such danger with this piece – it will surely cling to your throat like grim death. If you’ve been searching for a cursed Aztec coin to call your own, then Celtic Jackalope’s Pirate Medallion is a fine choice, indeed. It’s shiny, solid, and oh-so-piratey.